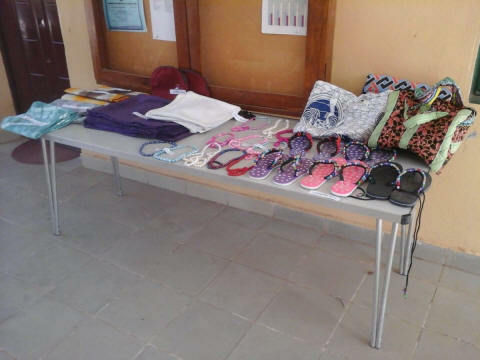 One of the things that we have been talking about for a long time now is the idea of displaying and then parting with goods made within the school (for donations). 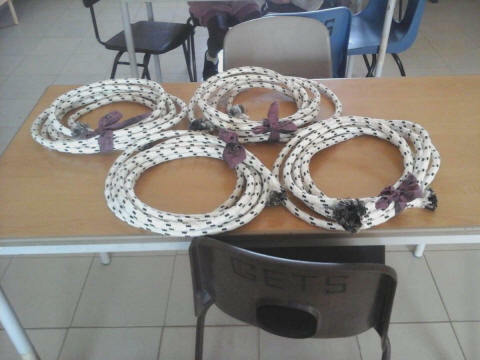 This type of shop starts to give the Skills Training students real practical skills about what sells, for how much and ideas about the quality required to bring in money. This fits well with the fact that some students will leave Sunrise to begin their own businesses and teaching about the whole idea of "How to make a Business work" is a key learning area. The Lower Basic 3 children have been out in the playground and measuring things. This time it was sand and water. We have plenty of sand in school but water has been a big problem recently with taps either dry or running very slowly. All of our Year 3 Skills Students are out working in business areas in the local area around our school and we try and visit them at least once during this 3 month period of work placement. 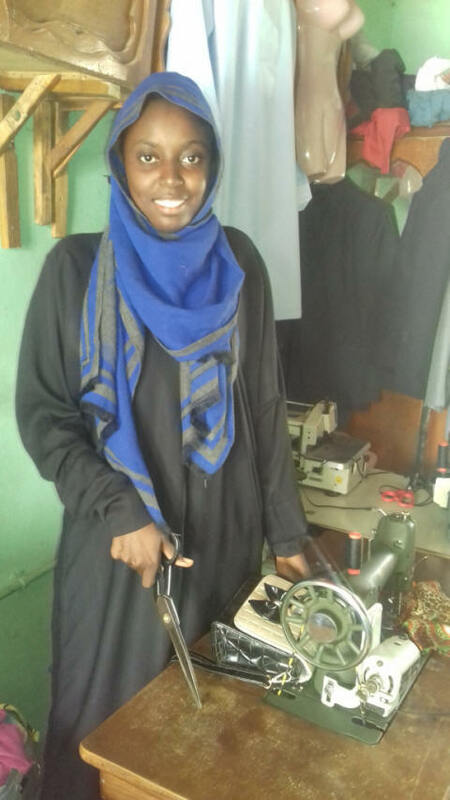 Mr Ali Bah went to see Kaddy Bojang (standing) and Jainaba Camara (sitting) in their Tailoring work placements. Their supervisors almost said the same; good discipline, punctual, hardworking, and enthusiastic about doing tasks assigned to them. 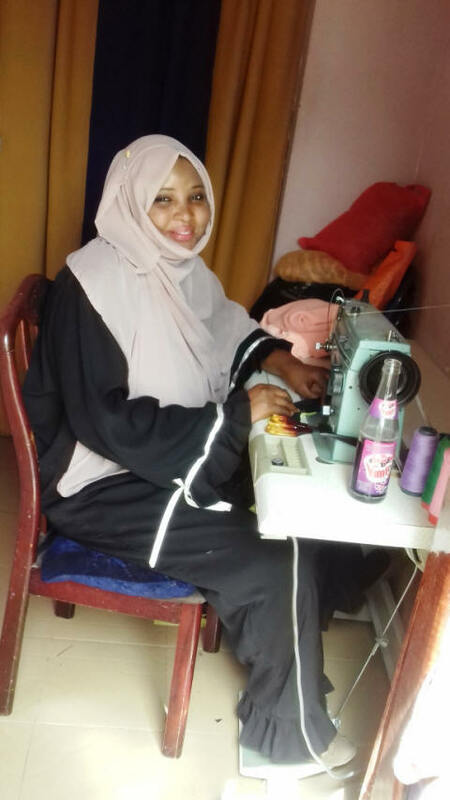 Jainaba has already been employed by her boss who said she's already an asset for the business, sewing four dresses daily, which is an achievement for both her and the business. Jainaba is now thinking about a time when she might start her own business. Kaddy's supervisor also said he will make a decision, before the end of her work placement, about employing her when she leaves Sunrise. This week we were pleased to welcome Angela Gourlay and Dean to Sunrise Centre. 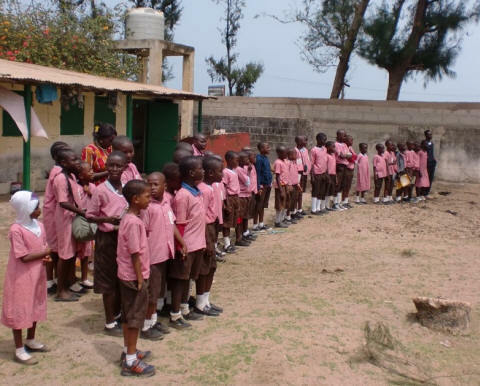 They had come to visit the student whom they sponsor, Aboubacarr Badjie. Aboubacarr is in LB1 now and is 7 years old now. Later in the week we had another school trip, this time for the Lower Basic classes who didn't go up to Albreda last month. They boarded the usual coaches and set off for the short journey (10 miles is a long exciting way if you've never been on a coach before) to Tanji on the Atlantic coast and the camel farm. The camels feel right at home in The Gambia where the sand is plentiful and it is hot and dry for 8 months of the year. 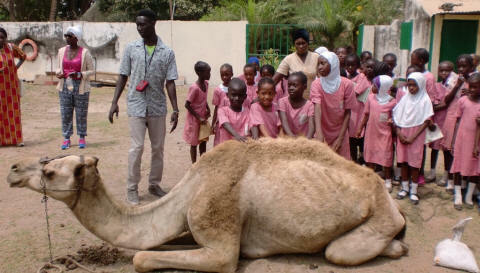 Managing school children who are excited is a challenge that the Sunrise staff do really well and local experts were pleased to explain all about camels to the children. From there the children went off to the beach of course for a picnic, made and served by our staff before they had fun and games in the surf. A lovely day out for all. 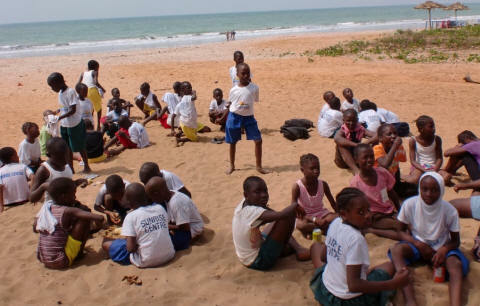 The big event this week was a visit by the Nursery school to the National Assembly of the Gambia (where all the political leaders meet) in Banjul followed by a beach party at the Poco Loco beach in Kololi, not far from Sunrise. 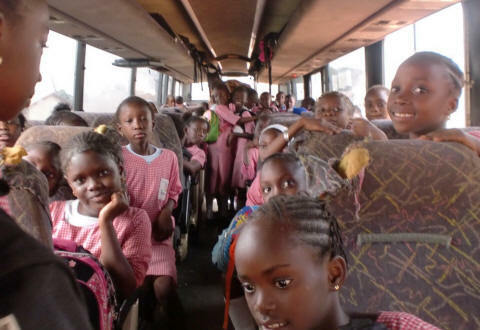 All of the Nursery children went with teachers and other helpers on a coach to the venue and lined up patiently for things to begin. 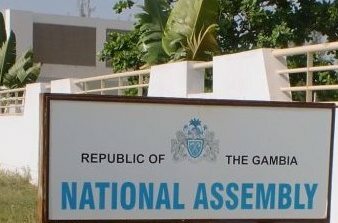 A staff member of the National Assembly, Mariamma Sonko, conducted a tour of the impressive building and answered questions before letting the children sit in the chairs where the Gambian leadership make their laws. 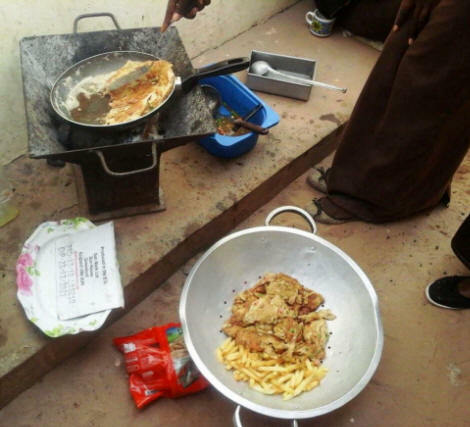 The beach party began with drinks and food, made by the staff. 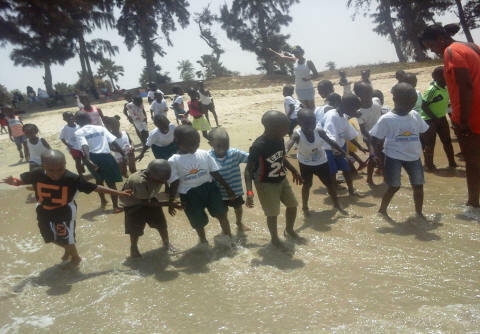 Then the games and paddling began in the warmish water (currently 23C) of the Kololi beach. Note that the local sea water reaches nearly 30C later in the year! 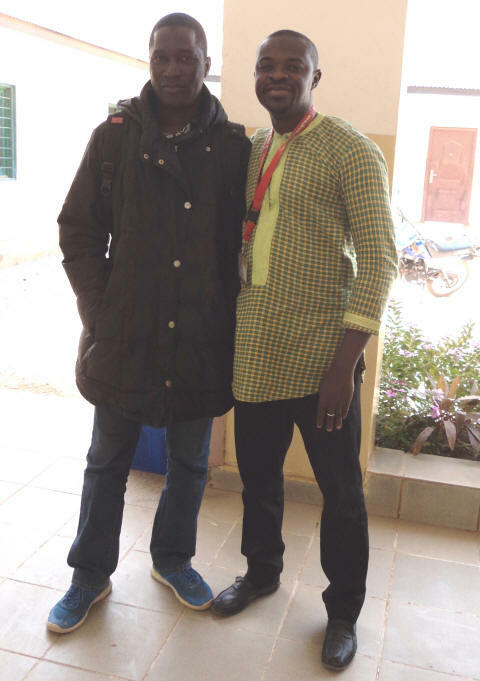 At the end of the week we had a visit from Mr Nurudeen Mbye, pictured here, on the right, with Mr Cham. Mr Mbye, a former Education Director at Sunrise, came to school to bid us a fond farewell and thank everyone involved in Sunrise Centre for the help and support he has received over the years. He is travelling to Frankfurt later this afternoon to embark on a new chapter in his life. After many years of emailing universities all over the world for scholarships along with his sheer grit and determination he has finally managed to secure himself a place at a university in Frankfurt to study International Law & Human Rights for the next 18 months. This week we found LB3 measuring the school hall. Fatoumatta Singhateh (Classroom Assistant) helped Mrs Cham with the whole class getting involved. 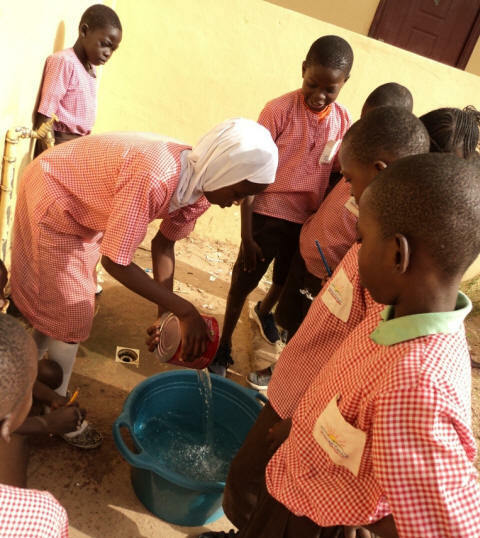 Mrs Jammeh (Cookery Teacher) has been teaching hygiene to the Skills 1 students. This usually means cleaning everything, whilst explaining why. 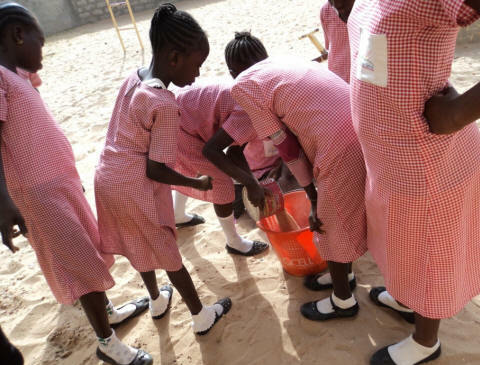 Keeping things clean in the sandy environment of The Gambia is not easy. 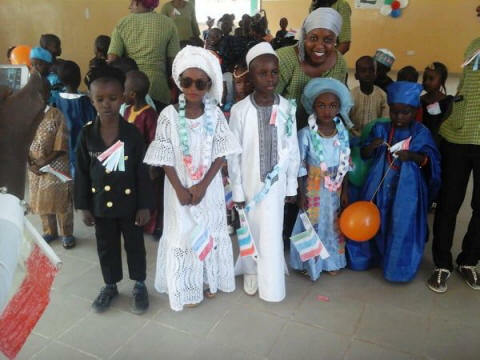 The whole Sunrise Nursery and Lower Basic schools dressed up to celebrate ahead of Commonwealth Day. It was an absolutely wonderful effort by the parents. We all walked singing and dancing around the local streets, to the surprise of the locals and taxi drivers who all took pictures. 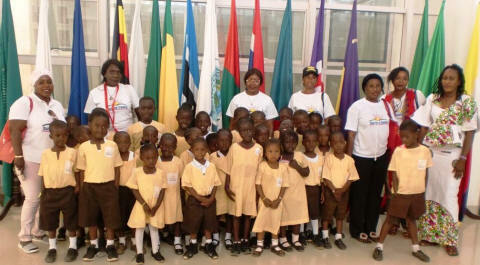 During the celebrations the children sang the national anthems of the countries they were representing. The whole day was accompanied by Mr Willams playing the drum. 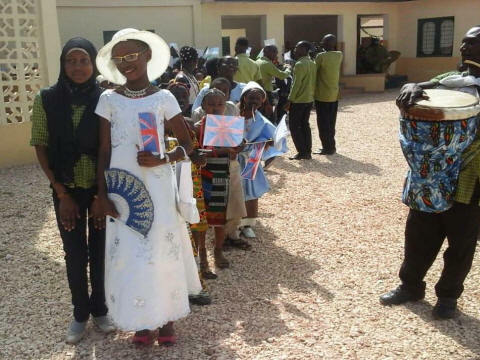 Gambia was allowed to rejoin the Commonwealth formally last year after a surprise announcement in 2013 by the old administration (under Yaya Jammeh) to leave. 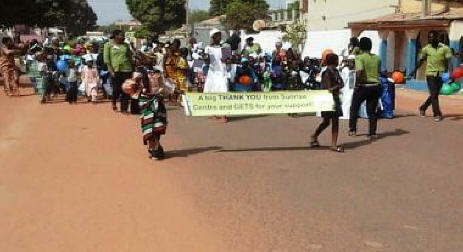 The sign carried by teachers said "A big thank you from Sunrise Centre and GETS for your support". 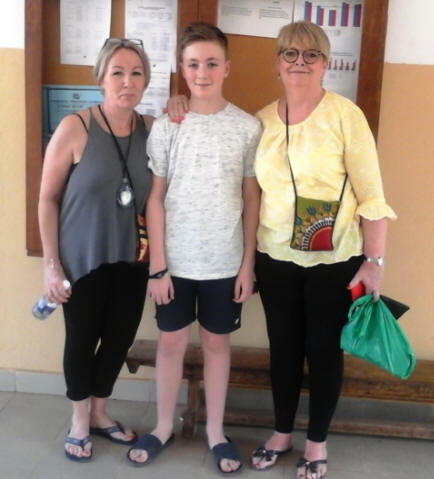 This week we were pleased to entertain two of our long-term supporters, Tom and Mary Ikin, who sponsor a student at a local school in the nearby area. They brought along their grandson William Livesey and his girlfriend, Eve, to see us at Sunrise too. William and Eve visited our beautiful library to find out the reading interests of the children before posing for a family photo with Helen in the Hall. Every year the Skills students make their own uniforms. 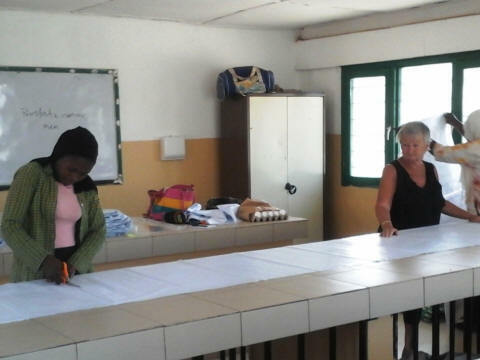 Starting with cutting out the cloth (guided by Fatou Nyassi and Chris Humphries), this is the trickiest bit because errors here can affect just how many we can make from a single bale of cloth. Colouring and treating comes next, using red/orange tie 'n dye processes. Then drying in the hot sun. Sewing will be next of course but that's for another day. 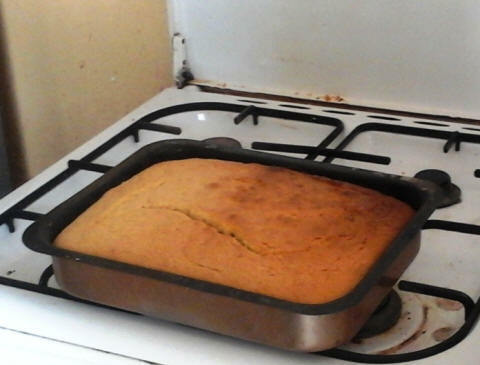 Elsewhere in Skills Training, the students were mixing and cooking cakes. Then icing them. Very ornate! 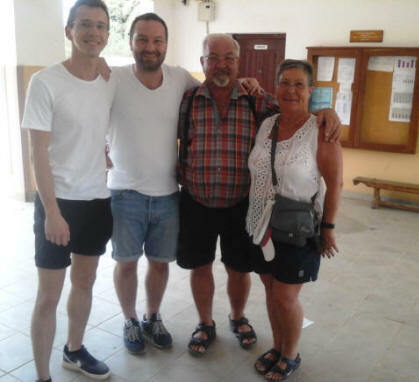 We are so grateful to Steve Humphries, seen at the back of the group here with visitors to Sunrise last week, (from L to R) Steve's wife, Chris, her daughter Selina and grandson, Joe. Steve has been helping at Sunrise with lots of DIY jobs to keep us going each day, as well as providing us with blog pictures. It is quite a challenge to keep things clean and tidy, just like in most schools but with extra sand everywhere! 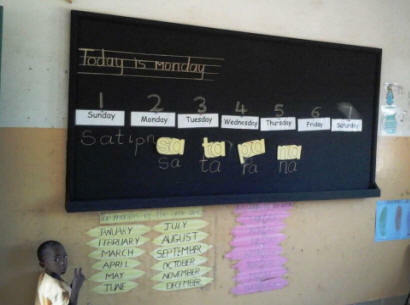 Mr Cham, Education Director, welcomed our new Cluster Monitor (School Inspector in UK). Ousman Sowe will regular monitor our performance by visiting Mr Cham and some of the Lower Basic classroom teachers to make sure that we are doing well. 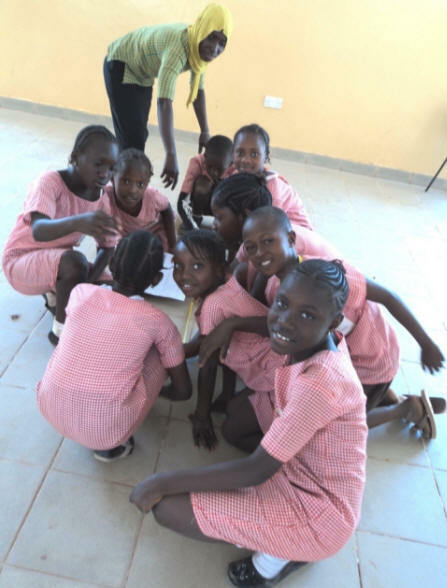 This week staff organised a school trip for Lower Basic Classes 3, 5 and 6 to the villages of Albreda and Juffureh and nearby Kunta Kinte Island (formally James Island). This is a chance to visit the Museum and try and understand a fundamental part of the history of The Gambia. 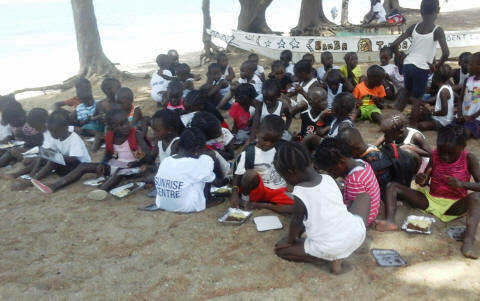 The children are pictured here with a model of the island where slaves were held, as a guide explains the background. 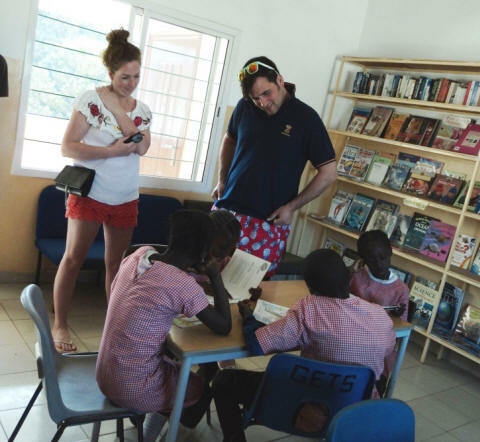 Danut is a teacher in Denmark and wanted to see a Gambian school. They all said they had a fantastic time with Chris as tour guide and they made a donation to the school. Their final comment, "It was beyond their expectations!" Jamila and her partner, Ryan Rowlands, also made their first visit to Sunrise and brought us some welcome resources. We also had another supporter visit - Diane Sheriff who sponsors Sally Gomez (LB4) and Ebrima Gomez (LB3). 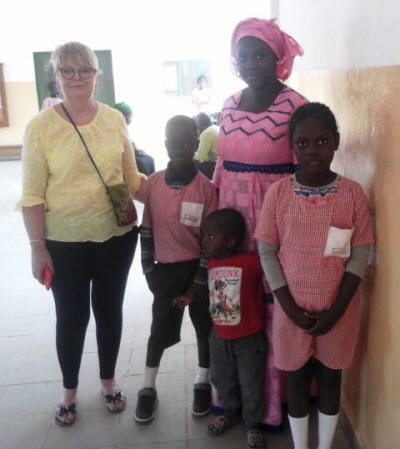 She is pictured here with the children and family that she helps - from L to R Diane, Ebrima, Mum with a little brother and Sally Gomez. We also had another supporter visit; Diane Sheriff who sponsors Sally Gomez (LB4) and Erica Gomez (LB3), pictured with the children and family that she helps. Pictured from L to R Diane, Ebrima, Mum with a brother and Sally Gomez.Below are Selina, Ba Ba and Joe . We also caught another picture of Selina and Joe posing with Diane. 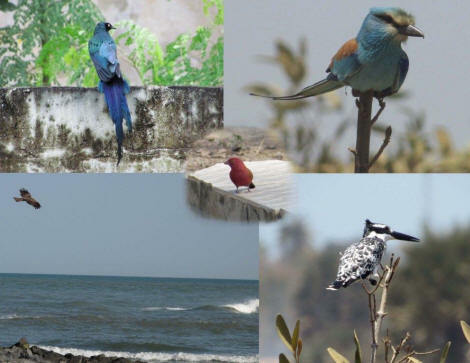 We thank them all our visitors - and all our supporters - for their help with our work. 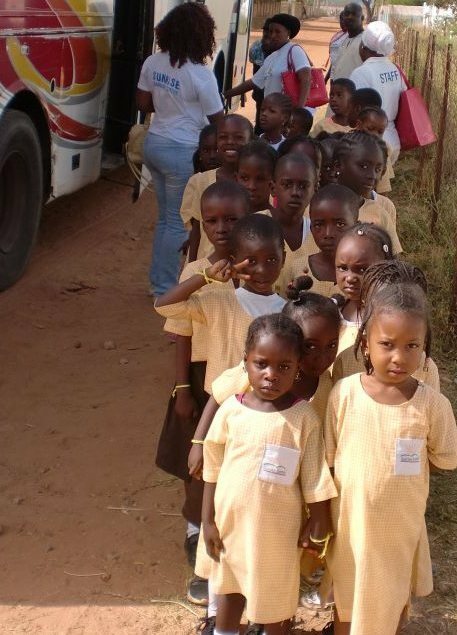 This week in Sunrise we helped by hosting a Gambia wide vaccination campaign against meningitis, also providing vitamin A supplement & de-worming for children aged 1 – 7 years. 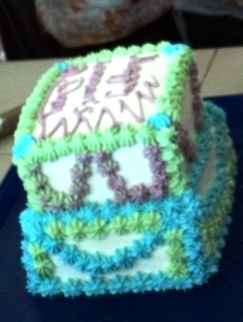 This included Nursery and some Lower Basic children at our school. Workers from the Gambian Ministry of Health came to Sunrise on Wednesday 6th February to carry out the programme. We are always grateful to our volunteers who come on a regular basis to help and support teachers in Sunrise. One such lady is Ruth Mcmeechan who helps us every year. 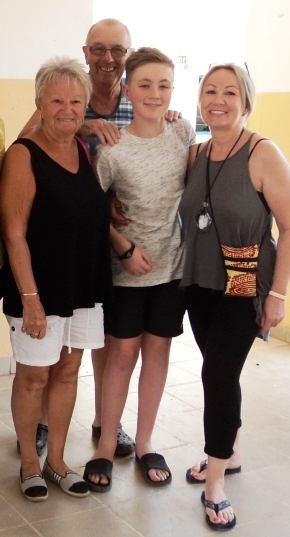 As a retired teacher, she brings a wealth of knowledge to help staff and as a regular visitor to The Gambia, Ruth is also much welcomed by all at Sunrise. 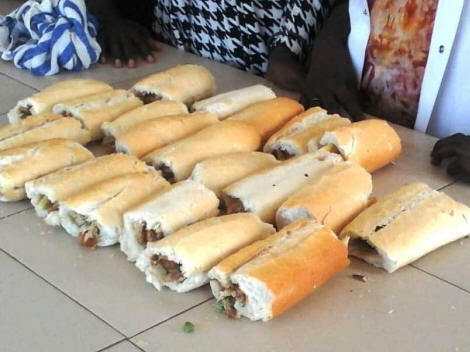 Keeping things going in The Gambia is a challenge. The conditions are great for holiday makers but mean that many things that we expect to last for nearly ever, go brittle in the sun and eventually need replacement. 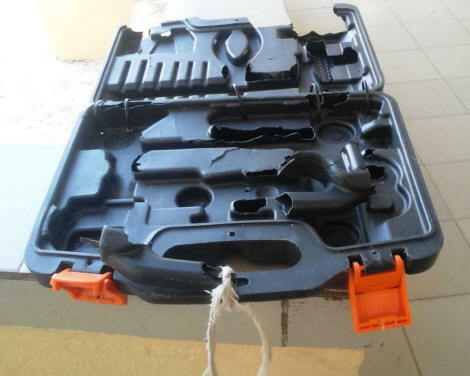 Our school tools box (or one of them) is an example. We are now regularly going through things that are now at end of life. An extra cost to our charity. This week we were pleased to hear from two of our supporters; Judy and Giles Pepler. They have both been coming to see us in Sunrise for a long time now and we are grateful that they help two of our Skills Training Year 3 students. 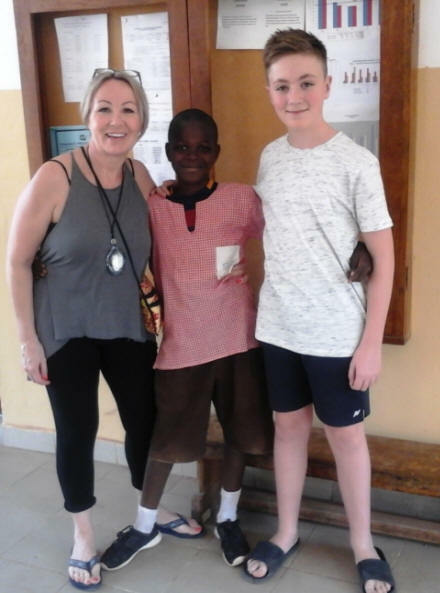 Both of these students are on attachment at present but Judy and Giles were please to meet up with Fatoumatta Barrow (our Local Language Prefect), sponsored by Giles, in a local tailoring shop in Sukuta (next to Bakoteh). Saikou Touray, sponsored by Judy, introduced her and Giles to everyone at their family compound. Saikou (our Head Boy this year) is on work experience at a new hotel in the tourist area. 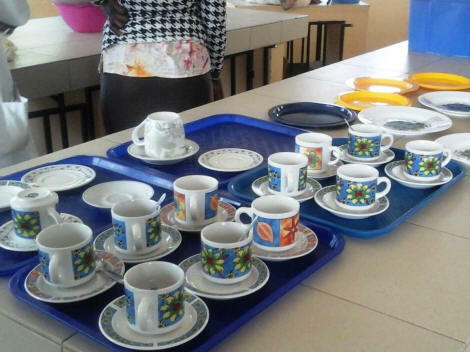 They also had the best china out to practice serving at tables in the hall, as part of their course in bar and restaurant work. 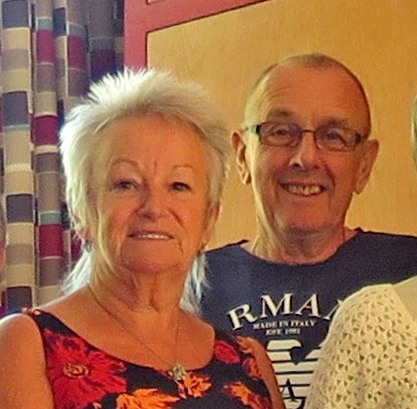 This week we were pleased to welcome Wendy and Philip Pulling again as regular visitors to Sunrise. Wendy and Philip sponsor Adama Dem (one of last years' LB6 leavers) and current student, Bubacarr Wally Jeng. 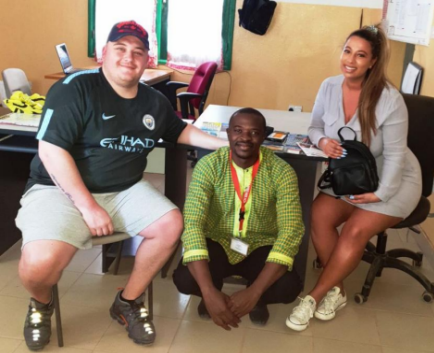 They are pictured here, on the right, with Mr Cham (Education Director) and Ramatoulie Ceesay (Admin Assistant). Steve Humphries has been helping us again, clearly enjoying his work! This time painting blackboards with some UK sourced paint. This produces a great finish as the second picture shows. Steve has also helped us capture some great pictures for the blog. 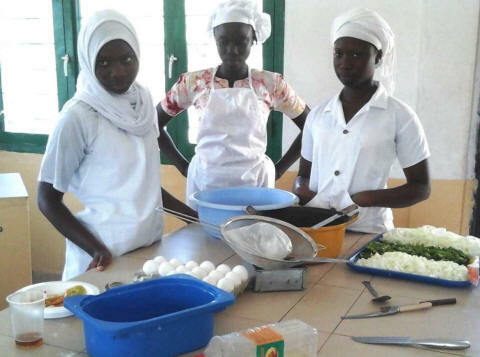 Cookery in the Bantaba, run by Mrs Alimatou Jammeh, was underway when Steve popped in to catch the students preparing to start work and took two pictures. The students often pose when they see a camera, as demonstrated by Mary Harding (far left). We have managed to find a new Classroom Assistant to join us; Hassanaou Bah (in pink) was appointed to Lower Basic on 7th January. 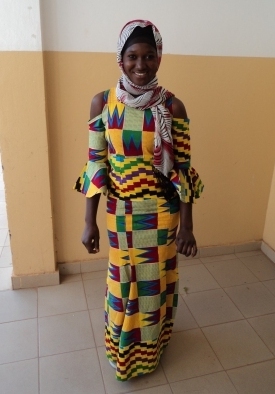 She attended Kotu Senior Secondary School from 2015 – 2018. She sat to the West African Senior School Certificate Examination (WASSCE) and graduated in 2018. This is her first employment. We are also being host to Ya Abie Janko (in patchwork colours). 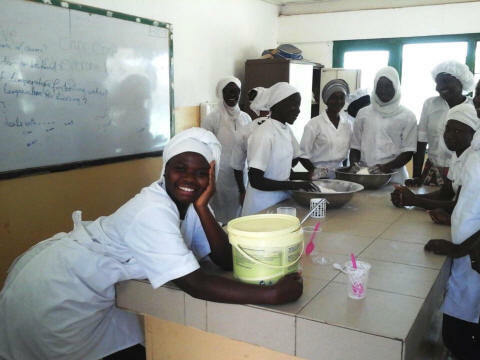 She is a student at Gambia College on their two year primary teacher training diploma programme. 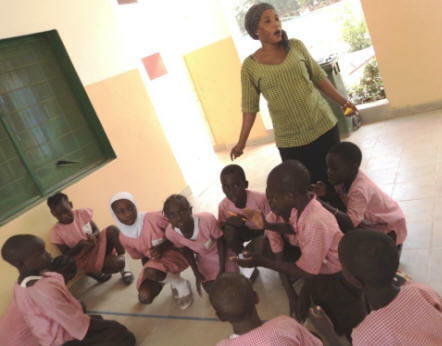 She started this programme in September 2017 and hopes to finish in 2019. She is on attachment at Sunrise Centre for T2 from January – April 2019. Our very own Yassin Yammeh (one of our classroom assistant)s is also doing her teaching attachment for the same course at Sunrise and should graduate with her diploma in 2019 too . This week we had a planned (and notified) Fire Practice. As it was the first this year, we briefed all the new youngsters to make sure that they understood. The evacuation took 5 minutes. The Sunrise garden has been cleared of weeds and is coming back to life again. 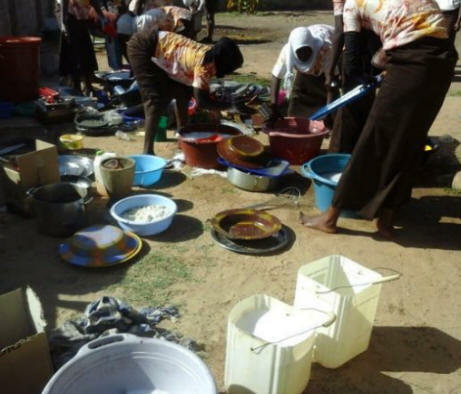 The delay this year was because of water shortages on the whole site. Gambia has a much improved electricity supply now but the next challenge seems to be water in some areas, including our part of Bakoteh. 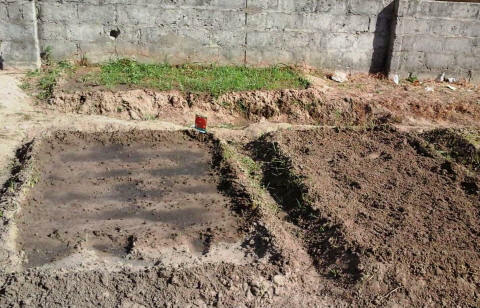 The priority for water use has not, therefore, been for the garden. 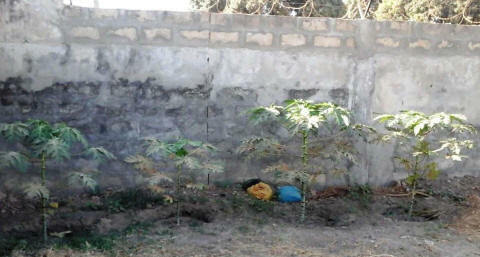 The pictures show the latest crop of cassava that been planted and beds prepared for other vegetables. This is the start of our second term of the academic year in the Sunrise Centre and the middle of the tourist season now. We had regular visitors to Sunrise on Thursday (from L to R) Joyce Derry, Jane Derry, Tracy Hill and Christopher Hill. They brought lots of resources, thank you. Jane, Tracy & Christopher sponsor students at Sunrise and Christopher is our Facebook administrator. 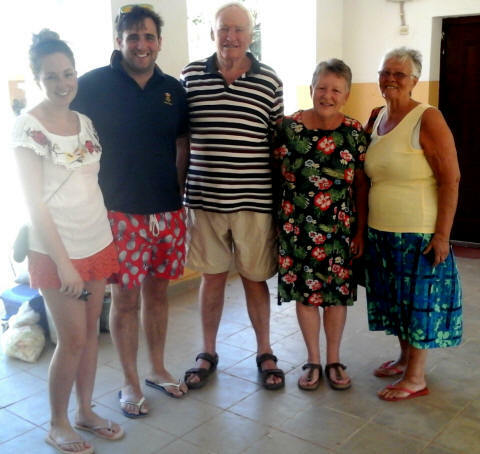 Also we were delighted to welcome Chris & Steve Humphries back to The Gambia this week. They are planning to come regularly to volunteer again at Sunrise. Thanks again! 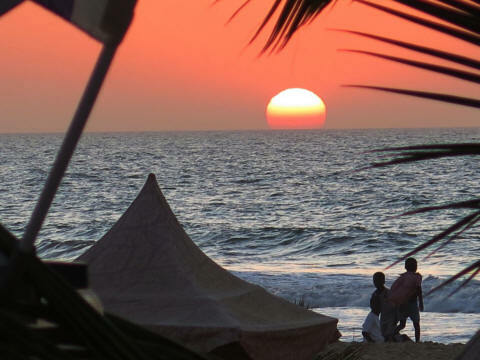 Nearly every night at this time of year we see beautiful sunsets down at the beach. These are very short but spectacular when the air is dusty because the sun sets really quickly in the tropics. 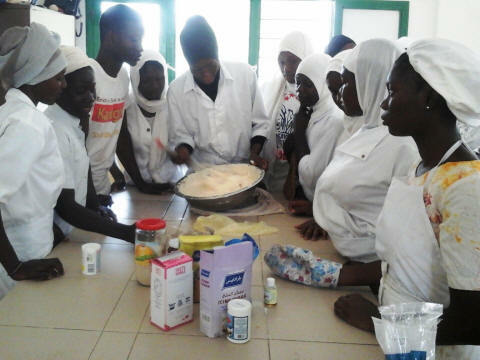 Our Cookery Teacher, Mrs Alimatou Jammeh, is seen here with some of the lads in Skills training. 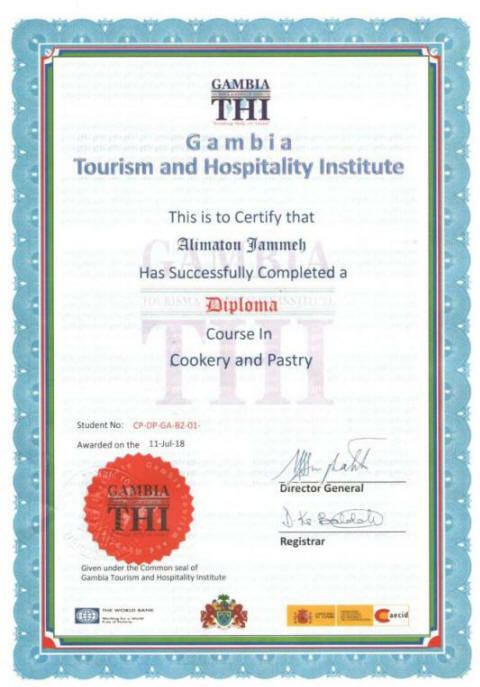 She finally received here Diploma certificate from Gambia Tourism and Hospitality Institute. Although she knew that she had passed the course last year, she has had to wait patiently for the proof, now being proudly exhibited.